Prime Minister Mahmoud Abbas, locked in a power struggle with Yasser Arafat, insists on being confirmed by parliament in a vote of confidence, sharply raising the probability of a showdown between the Palestinian leaders, a senior official said Wednesday. Abbas initially said he would leave the decision on holding a vote to legislators. His reversal came after mediators failed to resolve his dispute with Arafat over control of security forces, said the official who met for several hours with Abbas on Tuesday and spoke on condition of anonymity. "This is a very difficult situation," said Palestinian legislator Saeb Erekat. Abbas, who is increasingly unpopular, could be toppled in a parliament vote. His ouster, in turn, could throw an already troubled U.S.-backed peace plan into greater turmoil, since Israel won't deal with Arafat, reports CBS News Correspondent Robert Berger. The Palestinian prime minister was to address parliament Thursday to sum up his first 100 days in office. He has failed in his two key objectives — persuading militants to halt attacks on Israelis and improving the daily lives of Palestinians through progress on the "road map" peace plan. Many legislators, while critical of Abbas, have said they don't want to push him out and prefer that he work out his differences with Arafat. 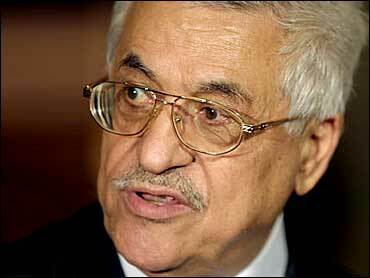 "I think that a vote of no confidence in Abu Mazen's (Abbas's) government is an improper and unwise vote," parliament member Ziad abu Ziad told the Israeli newspaper Haaretz. However, if Abbas insists on a vote, in apparent hopes of strengthening his position vis-à-vis Arafat, many legislators might not support him. "Arafat has become a symbol," abu Ziad said. "Everyone will support Arafat, will raise him up like their elderly father whom they won't give up." Palestinian Parliament Speaker Ahmed Qureia appears to have some discretion about deciding on the timing of the vote, and was meeting with aides later Wednesday to discuss the matter. The power struggle between Abbas and Arafat has intensified in recent weeks. Abbas, with the backing of the United States and Israel, demands that Arafat relinquish control of four security branches; Abbas commands the other four security services. Arafat has balked, fearing he would lose his main source of power. Israel and the United States want Abbas to crack down on Hamas and other militant groups, as required by the road map. Israel's Cabinet decided earlier this week to freeze implementation of the road map until Abbas orders a clampdown. Abbas and his security chief, Mohammed Dahlan, have taken some measures, including freezing the bank accounts of Islamic charities with alleged links to Hamas, but it remains unclear whether they would order a full crackdown even if given control of all security services. Ahead of the parliament session, Israel sent strong warnings to the Palestinians. Israeli Foreign Minister Silvan Shalom said Israel will not negotiate with a new Palestinian government handpicked by Arafat, and Defense Minister Shaul Mofaz warned Tuesday that Israel may have to expel Arafat soon if he keeps getting in the way of the road map. Mofaz spoke several days after Israeli security officials again reviewed a possible expulsion, and came to the conclusion that at present it would cause more damage than benefit. Zeev Schiff, a veteran Israeli military commentator, wrote Wednesday in the Haaretz daily that Israel might expel Arafat under three scenarios: Arafat refuses to relinquish control over the security services, Abbas is forced to resign, or militants carry out a major terror attack. Israel Army Radio reported that the United States has asked Israel for a clarification following Mofaz's expulsion comments. An official at the U.S. Embassy in Tel Aviv, speaking on condition of anonymity, said Arafat is considered "part of the problem, not the solution," but that Washington does not want him expelled. Several Palestinian legislators said privately that U.S. diplomats have warned them that the United States might withdraw as a mediator if Abbas is brought down. Chuck Hunter, a spokesman for the U.S. consulate in Jerusalem, declined comment on whether phone calls have been placed to Palestinian legislators. "Having said that, Abu Mazen is someone the (U.S.) president can work with and looks forward to continuing to work with," Hunter said. Arafat, meanwhile, was quoted as saying that the road map had no future. The plan envisions the establishment of a Palestinian state by 2005. "The road map is dead, but only because of Israeli military aggression in recent weeks," an American network quoted Arafat as saying. He also blamed the Bush administration for being preoccupied with Iraq and next year's presidential election. Erekat later clarified that the Palestinian Authority stands by the road map. "We want the road map to stay on the table, and we want the implementation of the road map," he said.